It’s already been an entire week since my supper club in London! I know a few of you were interested in seeing some pictures, so I thought I’d share a few here – along with the recipes from the night, of course. I’ll share them one at a time over the next few weeks, starting with potentially my favourite dish from the whole night – cheesy fried tortellini! It’s cheese and pasta; it was always going to be my favourite. Anyway, we got to the venue eventually, only slightly flustered and with only seven mascara smears on my forehead (success!). I had a lovely evening meeting some lovely blog readers and some lovely people who had never even read my blog before (I hope you’re here now, hello! ), and eating some lovely food, which the lovely chef and lovely kitchen team had prepared just lovely-ly. I’m sure everyone went home very happy with full stomachs! Thanks to everyone who came, I had a really really great evening. 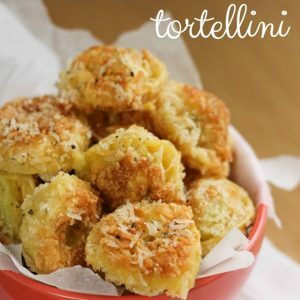 It pretty much does what it says on the tin – it’s tortellini that’s been breaded and fried, then tossed in a bit of finely grated parmesan (well, a veggie alternative anyway). 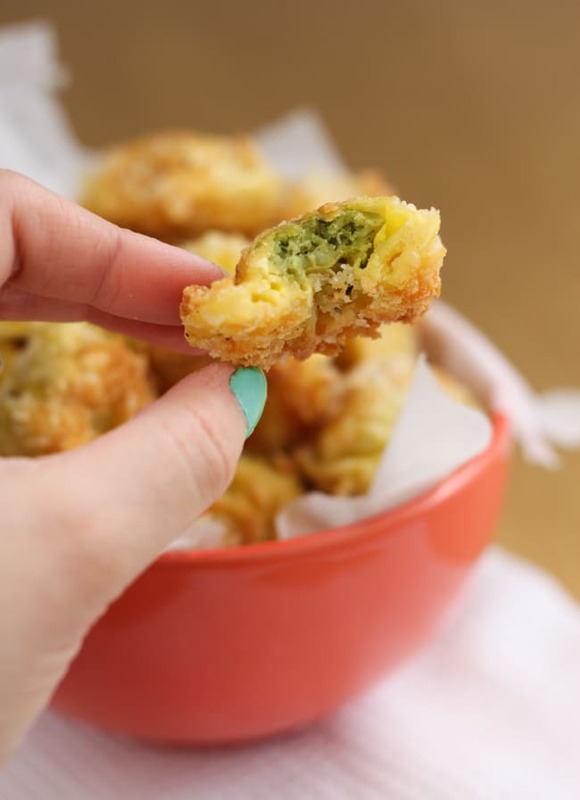 If you’re quick enough, the cheese is melted a touch by the hot breadcrumbs – and even if you’re not quick enough, you still end up with an incredible crispy, cheesy snack. As far as I could tell, this was a big hit with everyone who chose it at the supper club. You can use any type of tortellini you like. No, I don’t make my own tortellini (do you know me at all? ), but I did make sure I got the good stuff for a really top notch appetiser. I used a spinach and ricotta tortellini, but mushroom tortellini, sun-dried tomato tortellini, or pretty much any other kind of tortellini would be amazing too. 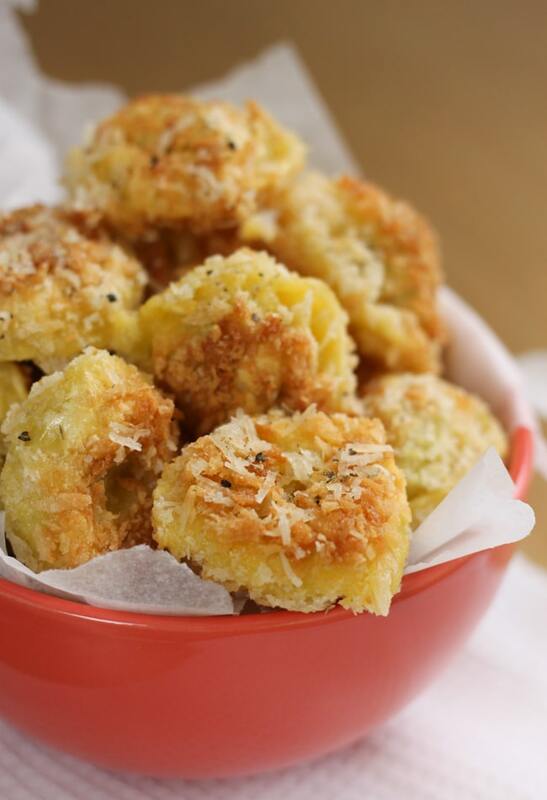 Let’s be honest, it’s hard to ruin cheesy fried tortellini. Boil the tortellini in a pan of water for just a couple of minutes, until half-cooked. Drain them, and gently spread them out on a lined baking tray in a single layer. Leave to cool. 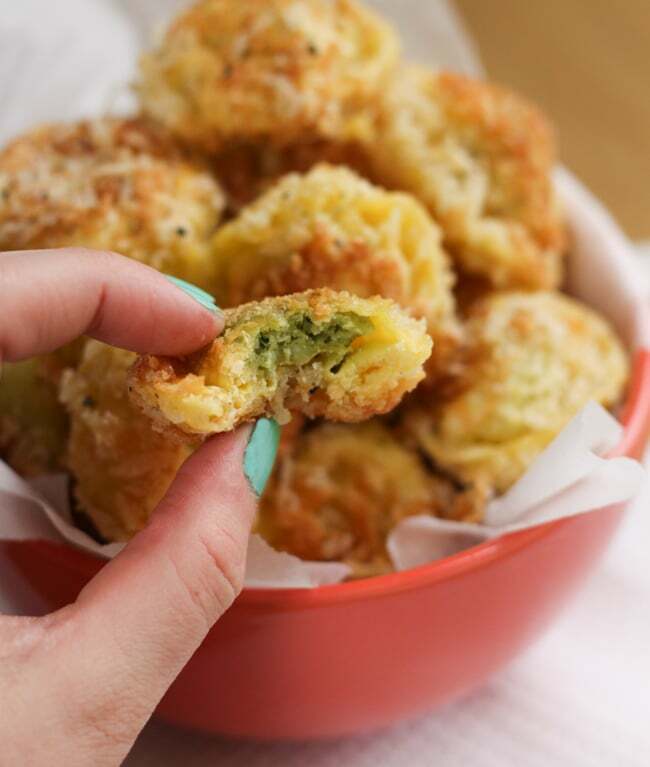 Toss each piece of tortellini in the flour, then dip in the egg, then coat in the breadcrumbs. Place back onto the baking tray while you do the rest (I found it easiest to do this in batches of about 8 pieces at a time). When you’ve breaded all of the tortellini, heat about 1cm of oil in a deep frying pan or large wok (or, of course, use a deep fryer). 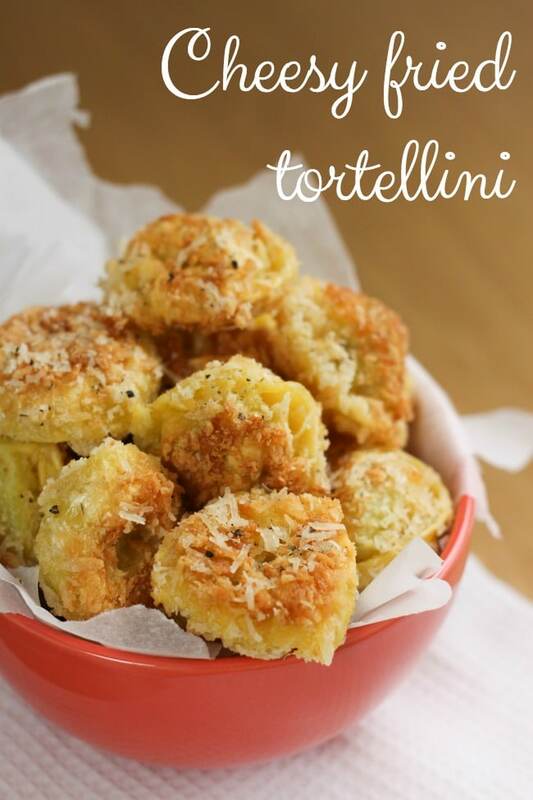 When the oil is heated to the point that a breadcrumb will sizzle when added, add one batch of the tortellini. Don’t overcrowd the pan - the tortellini need to be in a single layer, with a bit of space in between them. When the undersides are golden brown, turn each piece over, and repeat with the other side. Leave the cooked tortellini to drain on some kitchen paper while you cook the remaining batches. When all of the tortellini are cooked, add the parmesan cheese and plenty of salt and pepper, and toss until all the tortellini are well-coated. Serve immediately. Want a cheesy appetiser that’s a bit less labour-intensive? 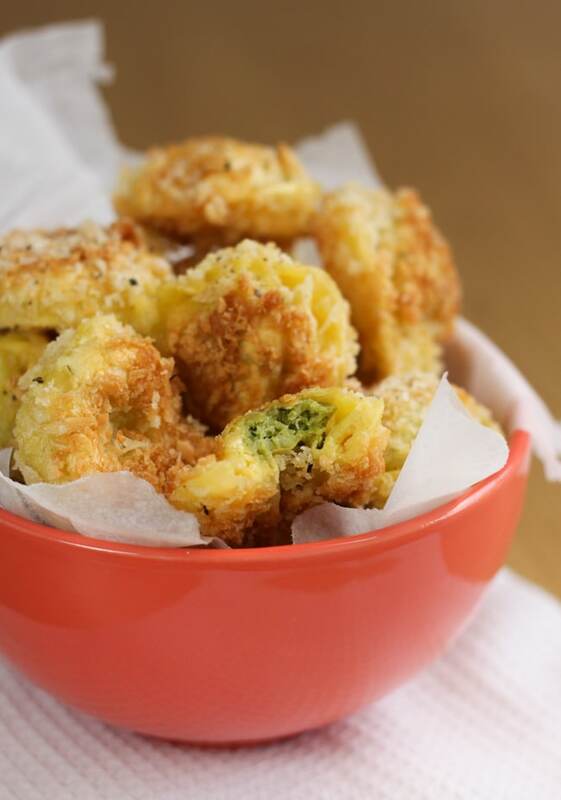 Try my chutney and cheese spirals instead – they only take 10 minutes to put together! These look great, but I’m confused as to why you specified vegetarian Parmesan cheese? Obviously regular Parmesan wouldn’t be vegan, but what wouldn’t be vegetarian about it automatically? ‘Real’ parmesan uses rennet, which is an animal product (I’ll let you google it, it’s a bit gross!). Cheaper versions (the sort of generic hard cheese you often find in the supermarket) is usually veggie though, so it’s an easy swap to make! I wish I could have made it to your super club. It looked like a great evening. 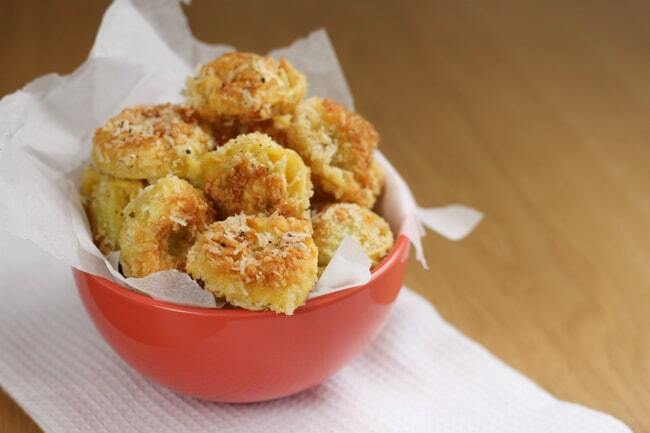 Yum, fried cheesy pasta, what is there not to love! I bet they were lovely, and well done on your supper club. Looks delicious and so glad you survived and enjoyed the supper club! It all sounds like a fantastic evening for you and your guests. Thanks for sharing one of the recipes here for your not-as-lucky readers. It looks deliciously naughty! That all sounds really fun Becca! All the dishes look so awesome. and you are right, its really hard to ruin a FRIED Pasta dish.. I cant wait to try it on. Ah, what a lovely tortellini! It looks like you had a great night. The tortellini does looks delicious. And I just really love cheese! Sounds like a fun evening! If I lived a little closer I would have joined you, but since I am in the Netherlands I will have to make do with the pics! What a fun night this must have been! You’re right, I don’t think you can go wrong with fried cheesy tortellini :) Congratulations on your first supper club, Becca! Mmm these look good! Massive congratulations on your supper club, it looks like you had a fantastic evening. I would never have thought of frying these tortellinis! Yum and what an awesome idea! I think pretty much anything is better fried haha ;) I don’t do it very often for obvious reasons, but that just makes it all the more special! Congratulations on your very first supper club! love the sound of those cheesy delights! What a fun night and a fun recipe you created.